That whistling sound you heard around the Bulls Wednesday was no longer the air leaking out of their playoff balloon as much as escaping relief in their voices after a smothering 99-79 victory over the Detroit Pistons. Taj Gibson with 23 points and rookie Tony Snell with 13 both had career highs. And the Bulls put on a defensive clinic in the second half, holding the high jumping young Pistons to 27.8 percent shooting and 26 points with a 19-0 fourth quarter run that choked off any Detroit hopes. But it was the veteran Bull, Deng, who stood tallest when it was most needed with the team sitting on four straight losses amidst the injury loss for the season of Derrick Rose. Deng had 27 points, six rebounds and five assists. But when the Pistons cut an eight-point lead to open the fourth quarter to four points and later five, and it was looking like the fragile Bulls group of recent days might collapse, it was Deng both times with big scoring plays, a drive into a pull up jumper and a short driving floater. Those shots with suffocating defense from Kirk Hinrich and a reenergized Joakim Noah staggered the Pistons and the Bulls blew open the game and began to relax and smile for the first time since Rose’s knee injury in Portland last Friday. Happy holiday. No wounded turkey of a team anymore. And the Bulls, indeed, needed help. They’d lost four straight for the first time under Thibodeau. They’d fallen to 6-7 and instead of titles, observers were talking about tanking. And not an M1 battle tank, although the damage could be as severe in emotional terms. The players seemed about to be buried in their own remorse as they were walking unconscious in a loss to the Clippers Sunday and then disheartened in losing in overtime to the 1-14 Jazz Monday. But the sky seemed to brighten somewhat as they prepared for Wednesday’s game, and you know being in suburban Detroit it wasn’t the meteorological conditions. For the first time since Rose’s devastating second knee injury and subsequent confirmation he was out for the season, there was some noise at practice, shouts of encouragement and even some joking from Thibodeau. “We just were snake bit the last couple of games, the last few days,” said Gibson, who went to the gym in suburban Detroit Tuesday night after the team arrived from Utah even though there was no practice. Gibson shot and shot, and the shots went in against the Pistons as Gibson made his first seven and 11 of 13. Though it took a while to start their engines. The Bulls didn’t get much going in the first half, and it started out to look like another turkey and not so happy Hanukkah as the Bulls were having their lights blown out by the young Pistons. The Pistons shot 68.4 percent in the first quarter in blowing out to a 29-25 lead. Though a light shone in rookie Tony Snell, getting his second start and showing impressive shooting range with a pair of first quarter threes after he was the only Bull to even make a three in Monday’s loss to the Jazz. Thibodeau continued to say how impressed he is with Snell’s work ethic, especially for a rookie. Thibodeau notes that after practices and before games as the team is practicing more at the United Center this season, he finds Snell almost never leaving the building. Staying around a basketball court all day, of course, is Thibodeau’s idea of a social life. So he likes the kid. And the kid, finishing with 13 points on five of nine shooting, was a welcome relief for the offensively challenged Bulls. Who still were missing that defensive intensity, edge, fight, all the things Thibodeau has been talking about that are vital to be able to compete without Rose. It was awhile coming as Andre Drummond and Josh Smith continued to batter the Bulls on the boards, 21-12 overall in the first half and six to one on the offensive boards as the Pistons took a 53-51 halftime lead. But the Bulls this time were seeing something coming as Gibson scored 11 second quarter points. They included a terrific baseline move by Greg Monroe, a nice score on a Deng pass, a roll and score on a Mike Dunleavy pass as the Bulls offense was finally showing some activity. And accuracy from the baseline. You began to see the offensive pulse as Deng and Kirk Hinrich added threes just before halftime. There have been plenty of elephants in the room for the Bulls since the Rose injury, and, yes, it seemed at times no one was shoveling behind as there was a stink. The biggest elephant was Joakim Noah, who generally was alternating between an emotional meltdown and general boredom. Sure, the Bulls needed scoring, and that’s not Noah’s forte. But they more required his inspiring energy. And it’s generally been missing since Rose got hurt, and in the first half with one point and one rebound. But then after halftime, the storm clouds dissipated and the rainbow that is Noah’s emotional energy began to emerge. It was no coincidence the Bulls then went on to their best defensive half of the season, holding the Pistons to that 26-point half. And it showed at a vital time Wednesday on the defensive end in holding off the Pistons big guys and finally becoming accountable on offense. Noah collected a Deng pass for a slam dunk to tie the game at 55, slashed for a score on another Deng pass for a 59-55 lead as the duo began again to work well in screen and roll. Noah and Deng had six points each in the quarter as the Bulls took a 76-68 lead after three quarters. Meanwhile, Hinrich was flustering and frustrating the flummoxed Brandon Jennings, who completely took the Pistons out of their game as he tried constantly in vain to get by Hinrich. This, of course, upset Smith, who thus stopped getting the ball. So when he did he wandered back to the three-point line to take odd looking jumpers. 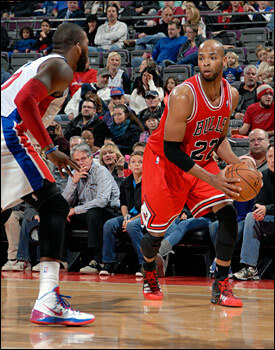 It was unraveling for the 6-9 Pistons, who were led by Rodney Stuckey with 25 off the bench. This time it was winning an unlikely jump ball and the Bulls defense went back, finally, to protecting and helping in the middle, fighting over the screens and making everything difficult. And then it was Deng, averaging 24.3 points the last three games. Being the so called closer never really has been Deng’s game. But without Rose he continues to come up with big plays. And Deng did so Wednesday with the big baskets of the game, a pullup 16-footer with 10:21 left after the Pistons got within 76-72 and a driving floater after Detroit got within 80-75 with 8:39 left. There was plenty of time to blow the game as the Bulls got into the penalty less than three minutes into the fourth quarter. But the combination of Deng’s clutch shots and ferocious defense and rebounding enabled the Bulls to hold the Pistons scoreless more than seven minutes in a 19-0 run that made the game a rout. 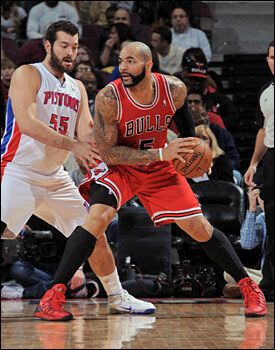 It became a Bulls kind of game, the sort they’ll need to play without Rose. They got their assists up again, thus with more ball movement, to 24 for 12 for the Pistons. That suggested they were defending better by not allowing the guards to penetrate or beat them off pick and rolls. The Bulls had been lazy about not fighting through the last few games. Also, the pace slowed with an 8-7 Pistons fast break lead. That meant the Bulls were able to get back more often to set their defense. And the Bulls got back on the boards with a 28-17 second half margin. The Bulls even shot threes better than the opponent with the starters making all six: Snell with three, Hinrich with a pair and Deng one. Deng, of course, has been the subject of trade speculation, mostly by fans and media since the Rose injury. ESPN then started it in what could be months of unsubstantiated rumors, claiming Cleveland was talking to many teams, including the Bulls, about unhappy guard Dion Waiters. There were reports last week in Cleveland that Waiters may have assaulted teammate Kyrie Irving. This time they did and threw away the key on the Pistons.